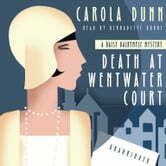 This first installment of a new cozy mystery series transports listeners back to the bygone era of 1923 Britain, where unflappable flapper and fledgling journalist Daisy Dalrymple daringly embarks on her first writing assignment-and promptly stumbles across a corpse. No stranger to sprawling country estates, wealthy Daisy Dalrymple is breaking new ground in having scandalously traded silver spoon for pen and camera to cover a story for Town and Country magazine. But her planned interviews with the inhabitants of Wentwater Court give way to interrogation after suave Lord Stephen Astwick meets a dire fate on the tranquil skating pond. Armed with evidence that his fate was anything but accidental, Daisy joins forces with Scotland Yard to examine an esteemed collection of suspects and to see that the unlikely culprit doesn't slip through their fingers just as the unfortunate Astwick slipped through the ice.